Mytee is proud to introduce the Escape ETM, our revolutionary electric truck mount system. 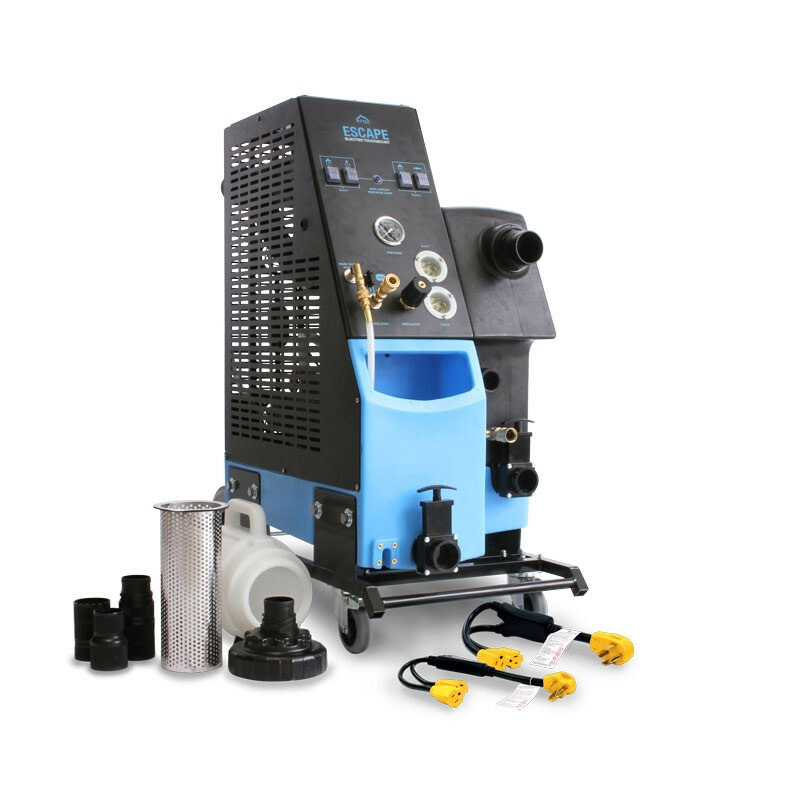 From carpets and upholstery, to hard surface cleaning and flood extraction, the Escape ETM gives you the power of a truck mount, with the mobility of a portable extractor.The Escape has broken the mold of traditional truck mounts by offering cutting-edge features that set it apart from other truck mounts. For your convenience, the Escape ETM has been engineered to be powered three different ways. The first option is to use the included adapters to run the ETM off a 30 amp 3-prong or 4-prong dryer outlet. If a 30 amp dryer outlet is not available, you can run the ETM off of four separate 15 amp outlets. You will need to purchase two Mytee Hunter Box Adapters to use this method. The final option for powering the ETM is to use a generator. The ETM requires almost 7,000 watts of power to run, so make sure your generator is rated to run the ETM. Please call 888-722-5508 if you would like to purchase these accessories individually. This crush proof 25 foot hose is made for Mytee machines and is 2 in diameter to allow for quick recovery. The 1/4 inch solution line is rated for 3000 PSI at 250 degrees Fahrenheit and is made with durable brass quick connects to handle Carpet extractors that can deliver water temps higher than boiling point. This hose is essential to hook up to accessories with 2 inch connections like the Mytee® T-REX™ Total Rotary Extractor. Made to be used with the Mytee Escape portable truckmount carpet extractor, the converter kit converts two 115v circuits to one 230v circuit. Useful for when there isn't a 3-Prong or 4-Prong Amp outlet nearby, this kit will make your extractor more versatile than ever. Reduce the noise of your extractor by using this muffer assembly. Simply connect these to the back of your machine for instant reduction of decibels. Made of durable nylon construction, these mufflers come in sets of 2. Designed to be substantially lighter than metal containers and with a slim design, these 80 gallon tanks are made to be installed in your van or truck. The revolutionary baffle design reduces the movement of water during transport and allows for maximum airflow with multiple entry points for the vacuum source. Three removable lids make clean-up easy. Without cart: 32.25" x 21.5" x 36", With cart: 43" x 21.5" x 44.5"
Customers who were interested in the Mytee® Escape™ Adjustable 500 PSI Portable Truckmount Carpet Extractor were also interested in the following items. This is a review for the Mytee® Escape™ Adjustable 500 PSI Portable Truckmount Carpet Extractor.